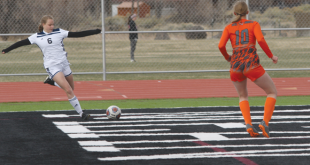 It was another ugly start for the West Elk Soccer Association (WESA) u19 boys team but this time they turned their game around to finish off the Montrose Avalanche 5-1 on Sunday, May 20. WESA has suffered a number of lopsided losses this spring that seem to have a common theme, giving up goals early and often. On Sunday, the game teetered on yet another debacle as WESA opened the game sluggish and disjointed, only to give up a goal 10 minutes into the game. They almost gave up a second goal two minutes later but goalie Slater Weil denied a shot from in close to keep Montrose in check. But rather than following their pattern of folding and giving up more goals, WESA recovered to match the pace set by Montrose, making for a frantic 15 minutes of soccer. During that 15 minutes, WESA managed to tie the game when Dylan Eaton spun past a Montrose defender and slipped the ball far post to tie it up 1-1. Ten minutes later, WESA struck again as Carlos Franco dropped a corner kick just outside the six-yard box to find Linehan crashing and connecting with his knee for a 2-1 lead at halftime. “We started to make the simple passes, stopped trying to force it and found our game,” says Linehan. 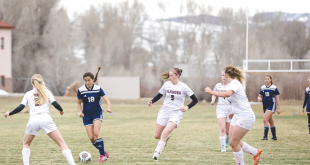 A switch in the direction of play for WESA players had the wind at their backs for the second half and they continued to press the Avalanche, mixing in attacks down the flanks and down the middle with a couple of stints of possession soccer. With Owen Berv, Finn Smith, Henry Bryndal and Nathan Miller rotating through the three spots on the back line, the midfield was left to their own devices and both Linehan and Kye Matlock went to work. Matlock used the vacuous midfield left by Montrose to look hither and yon for open teammates wide and up top while Linehan repeatedly joined the attack from his defensive position. WESA scored its third goal of the game 15 minutes into the second half as Nathan Miller stripped the ball from an attacking Avalanche player and turned it up field. Miller found Connor Crossen with a pass and Crossen flicked it on to Linehan, who pushed it past the oncoming Montrose goalie. “The ball was served to me on a platter,” says Linehan. Two minutes later, WESA struck again as Alexander Dumas rose above the defenders to head a cross from Crossen into the low corner for a 4-1 WESA lead. WESA then put the finishing touches on the win in the 70th minute as a quick set from an indirect kick by Eaton found Linehan wide open and he scored to finish off his hat trick of the day. WESA will host Roaring Fork on Saturday, May 26 at Rainbow Field at high noon and then will hit the road on Sunday to face Olathe.